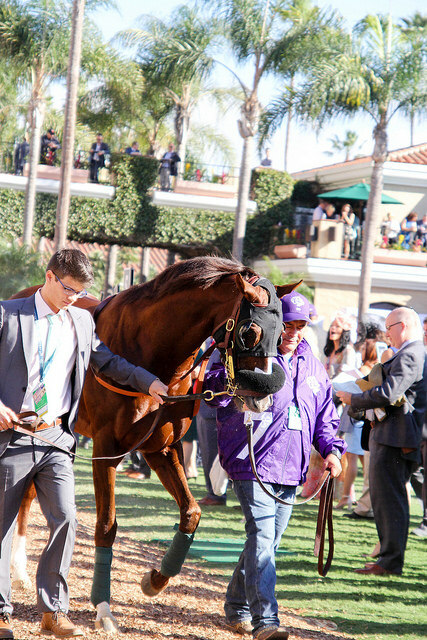 Six months ago blogger buddy Susan asked me if I wanted to go to the Breeder’s Cup. Despite not following horse racing at all, I enthusiastically agreed. Going would be part of my “Do all the things in California” plan, and I figured it was something to knock off the horsey bucket list. 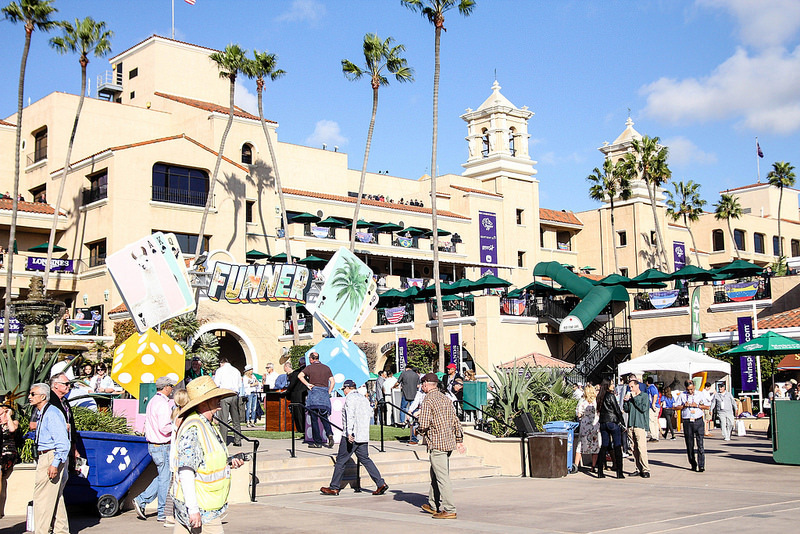 So yesterday I joined her and Carey, and we headed to the Del Mar Fairgrounds after the 4th race on the Breeder’s Cup card. If you think that sounds like a late start to the day, it was. 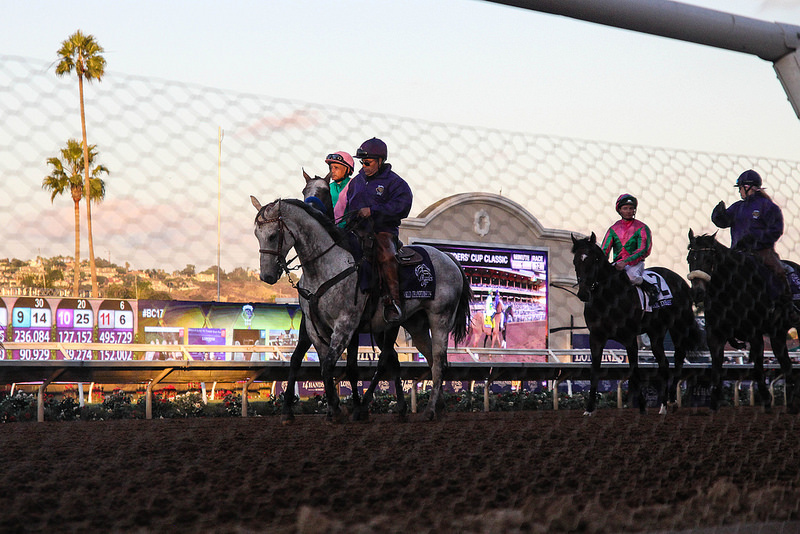 The track gates opened around 9-10am, and the first Breeder’s Cup race went at 12. I was fully supportive of our fashionably late plan, because I left my dogs cooped up at home in Riverside and also didn’t want to be on my feet for twelve hours. At $75 a pop, our tickets were the “cheap” seats… except I don’t consider that cheap and we didn’t get seats. Ours were general admission, which meant we could meander around the track but couldn’t actually sit or you know, go into a bar with shade and seats. I heard rumors that fancier seats with tables and service went for as much as $1,500 a pop, but can’t confirm. 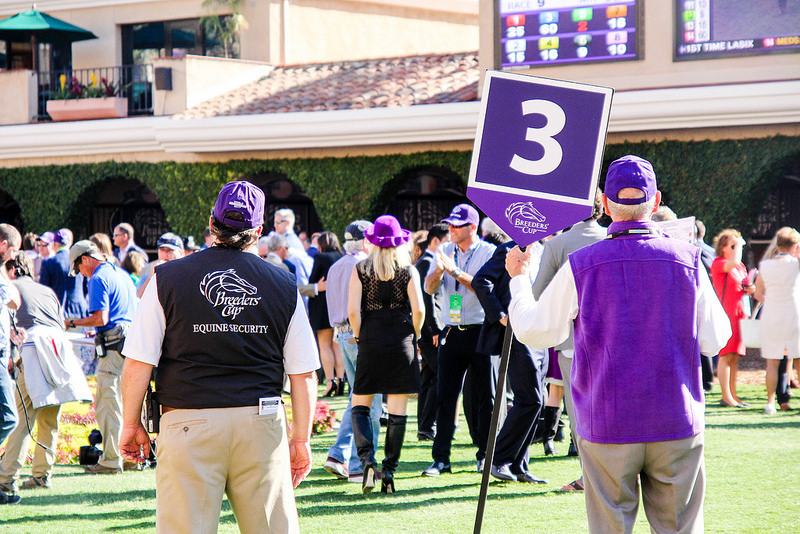 Basically, horse racing is an elite sport — the Breeder’s Cup, doubly so. I wasn’t really sure what to expect for the event. I’ve been to multiple meets at the Fairgrounds Race Course in New Orleans, Louisiana and Retama Park in San Antonio, Texas. At both of those tracks, the races I attended were never that special. Mostly claiming races and maybe a small graded stakes. 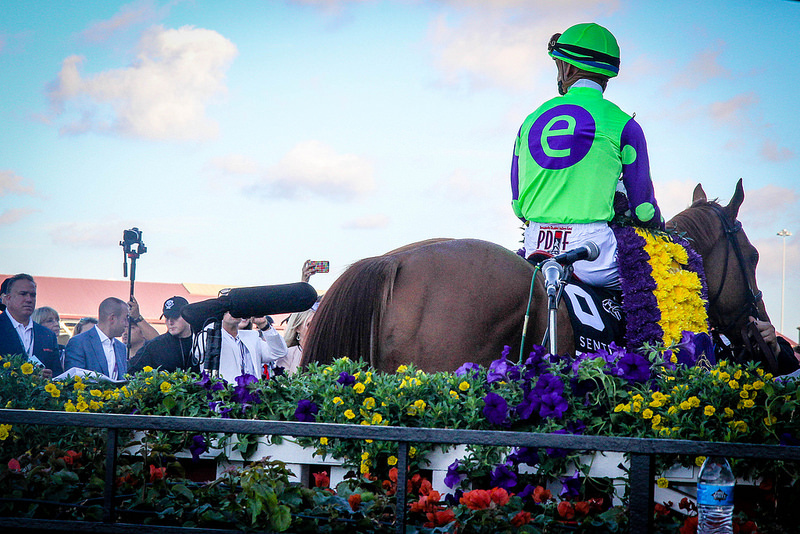 In the past, I’ve enjoyed the track because I could get super up close and get pictures of a discipline I have pretty much no experience with. 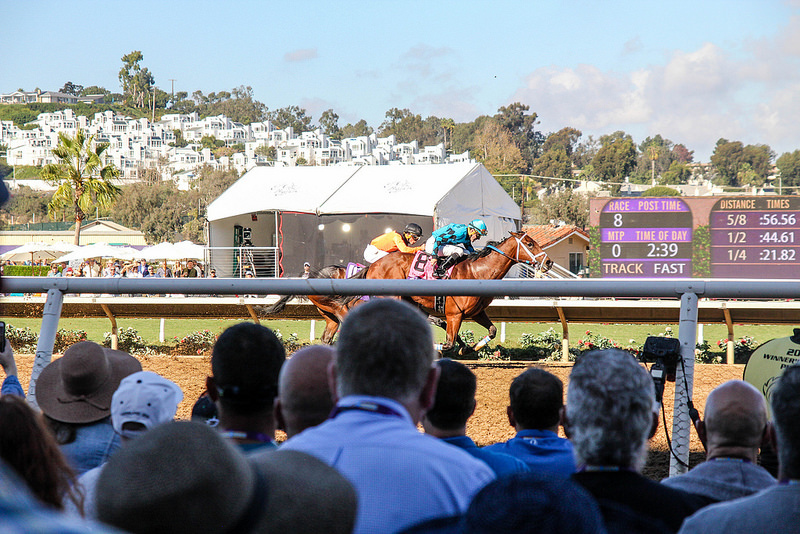 With the Breeder’s Cup, I knew crowds and security would be at a height so I made the decision not to lug my big 70-200 f2.8 lens out with me and instead brought a smaller, more versatile lens. That decision was a good one, because I wasn’t there for an hour before I realized that quality photography wasn’t going to happen. Instead, I kept my camera to try and capture some ambience of the event and more importantly — pictures of my friends. 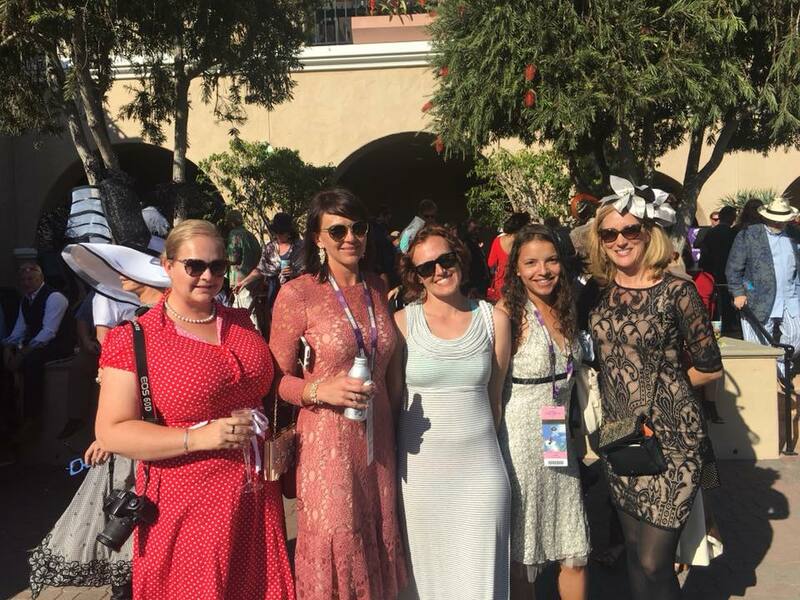 Saturday might possibly be the only day you could find five equestrian bloggers all fancy in dresses and in the same place. After I abandoned trying to take photos at the paddock, we met up with L and Jodi. About ten seconds after meeting Jodi for the first time, I made a beeline to the bar (she went with me, so we’re obvs great friends now) and got some Prosecco. As always, it’s great to chat with bloggers and meet people I’ve been reading for years. 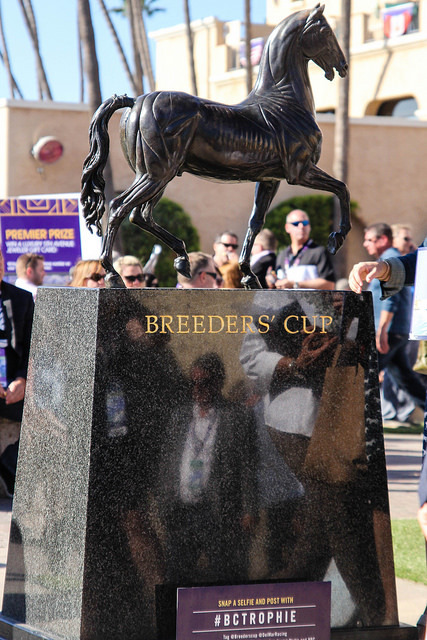 The Breeder’s Cup felt more like a party than a horse event to me. Almost everyone was dressed up (be still my preppy heart who adores men in pastels and bow ties), and more than half the crowd was fairly sloshed. If you need me, I’ll be starting a campaign for southern California hunter/jumper shows to have a formal dress code and bubbly wine on sale. It makes for a stellar experience. Outside of the track, they had tables setup with Blackjack. Longine’s sponsored a “Style” competition, which L’s beau was a semi-finalist for (which I’ll let her share photos of if she wants). That was fun to watch. I bet on one race (and lost). I bought an expensive t-shirt to prove that I’ve been there. There was excellent people watching to be had, and it was neat to be somewhere with as much buzz in the air about horses. 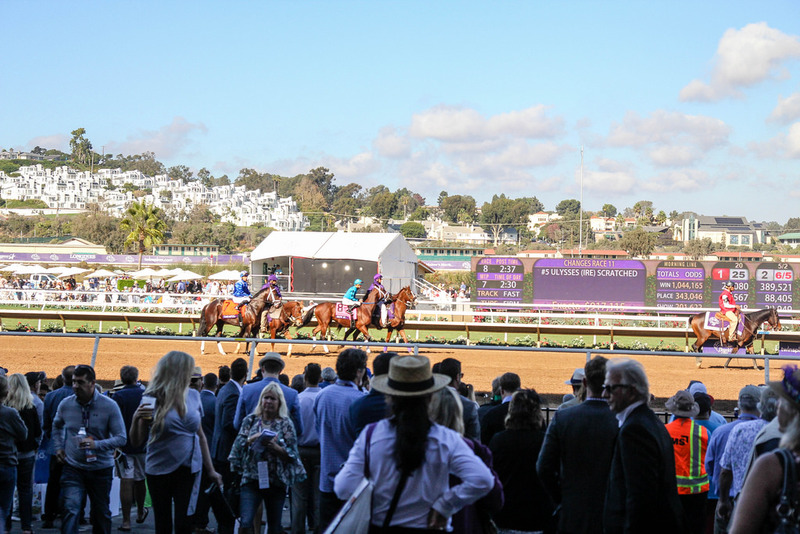 Whether as an excuse to drink irresponsibly, bet more than they should or appreciate horses — the thick crowds were jazzed to be at the fancy horse race. When it came time for the actual Classic, Susan, Carey and I parked ourselves at the rail. 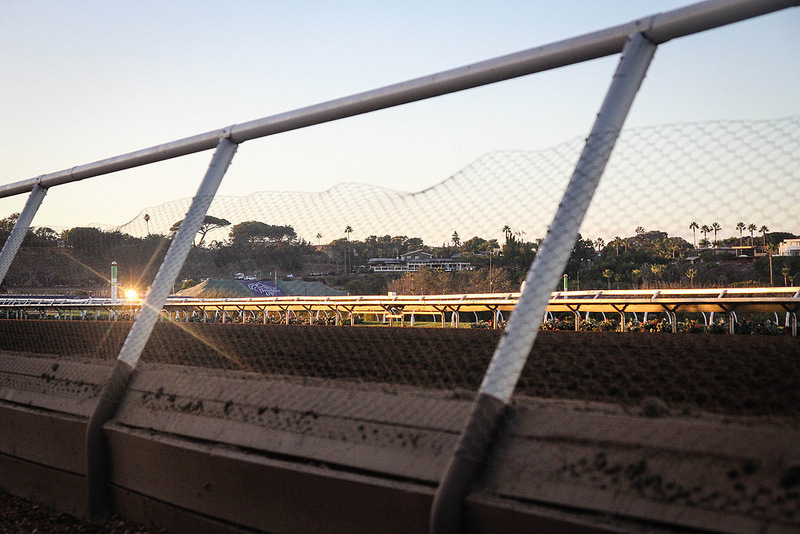 The sun set down around us, and the track was on the verge of dark when the best horses in the world finally loaded into the gate. They galloped right past our faces, went around twice and Gun Runner won. From my perspective, it was just a flash of hooves and excitement. I couldn’t really follow what was happening from where we stood, but I was certainly happy to witness it. I will say the experience varies greatly depending on where the BC is held. 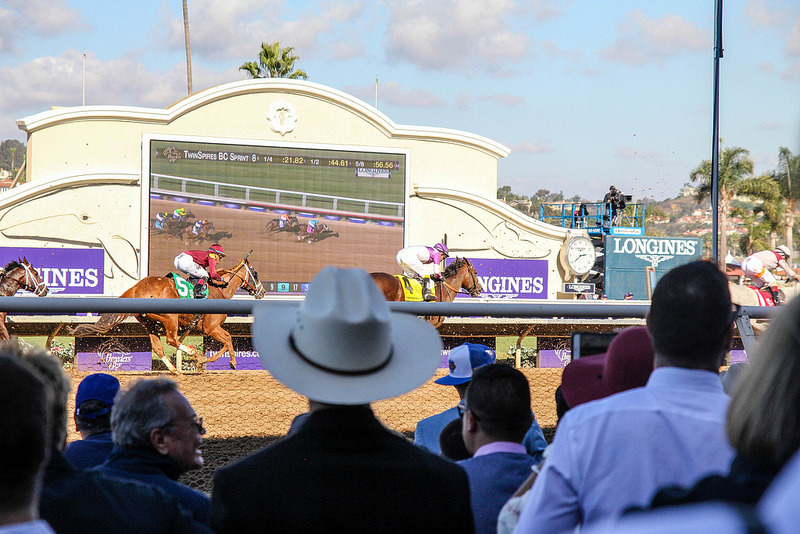 For example, when Santa Anita hosts the BC, general admission is like $35 and there are bleachers. 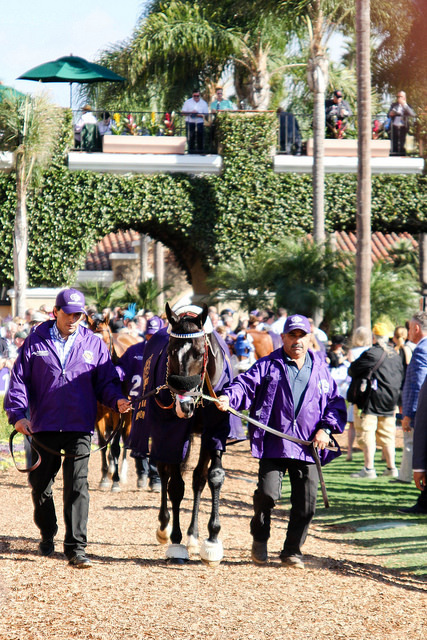 I love going to the BC at Santa Anita and really suggest it if you get the chance. 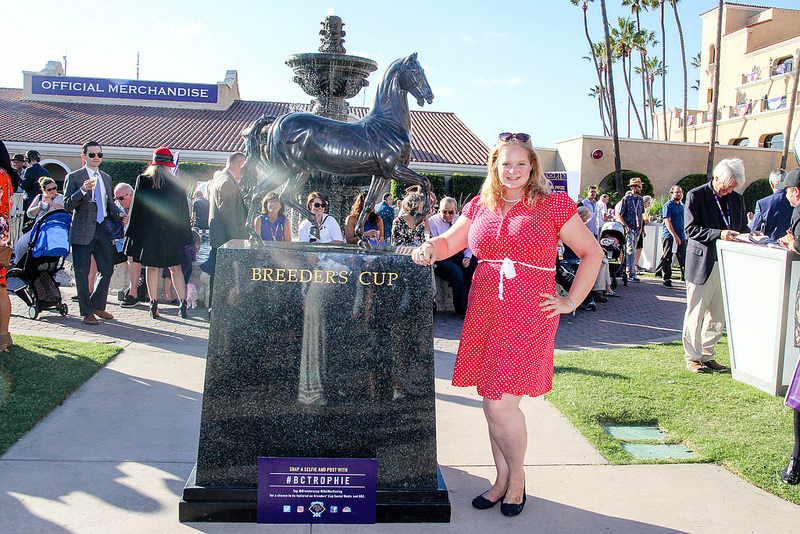 I am a huge racing fan – a west coast Breeder’s Cup is definitely on my bucket list. I went to the 2005 BC when it was held at Belmont, but it was a dreary, cold day in Nov in NY, and I definitely don’t remember it being a glitzy or festive crowd. I think they stopped holding them around these parts for that reason. November in the northeast just ain’t that pretty! It was a fun and good day! These are the types of events I enjoy watching from the comfort of my home. 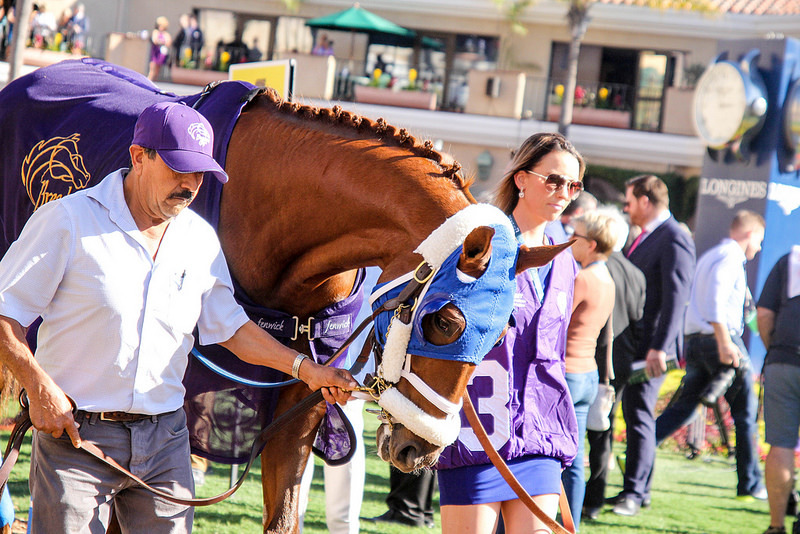 I like seeing every single horse in every single race/event/class, and the people and lack of seating and cost of tickets just isn’t my jam at all. Sounds like you guys had fun hanging out with each other at least, and it’s definitely one of those things to brag about being able to go to! I went to Breeders Cup two years ago at Keeneland. Tickets were stupid expensive, an there were still, ahem, seating issues in our section. People were literally screaming. The people at Keeneland told us Breeders Cup basically takes over/handles everything, not the host track. So it makes me hesitant to do another. But it was still a super cool experience! I just feel like for close to $500 a seat everyone should, you know, get a seat. Sounds like a really fun day! I lived in Saratoga while I went to college and the year after, and while I loved getting fancy and going to the track, I usually avoided the big races (like the Travers) just because it was so crowded. But it looks like maybe I should have sucked it up and gone one year, because this looks like a ton of fun! Hi! I love your blog! I was just wondering if you could give me some advice. I recently found out that the barn I have been riding at for 6 years is moving across the country. I’m not sure how to find another barn because I don’t want to be super picky and end up not finding another barn, but I also desperately need to keep riding. I’m nervous and worried and just waiting for something to fall into my lap. I know that I have to go out and look around, but I can’t seem to wrap my head around the fact that I might have to stop riding. How can I merge into another barn? How can I find a barn that is right for me? And how do I get over losing the horse I have been making leaps and bounds on? Thanks! How very cool! And great job with the photography – I think you met your goal of capturing the ambiance really well – it seems super magical! It was so great to meet you! I wish that I’d had more time over there. I’m glad that you had a good time and got to experience races of that caliber! Also, I’m almost always up for a beeline to the bar, especially if I’m on a rare vacation. Though, my wallet and my head were regretting that tendency the next day.